Videx One Way Black and White Door Entry System. This Kit is Surface mounted and Black and white (Mono). "The door panel includes a CCD camera with infra-red illumination to illuminate the picture in poor lighting conditions." conditions. 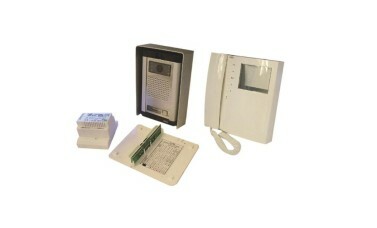 1 Button video kit including a surface mount door panel [Dimensions: 140mm(W), 209mm(H), 62mm(D)] with call button and name plate, mono camera c/w IR illumination. 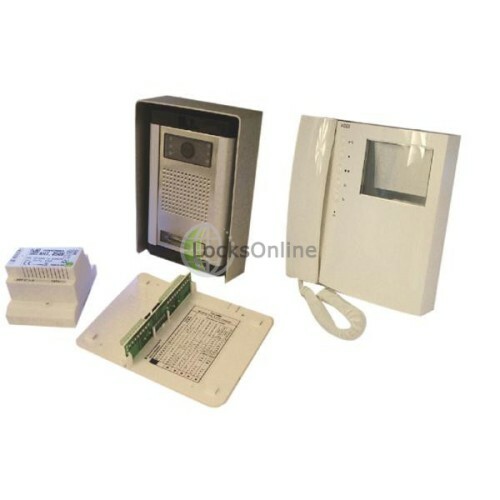 A 24Vac DIN box transformer and a wall mountable video handset with CRT, electronic call tone, camera recall facility, door release facility and three service buttons.